Originally I intended to draw Kup fighting the Sharticons inspired by the Transformers The Movie scene. But when I showed the pencil sketches around I kept getting asked the same question, “Where’s Hot Rod?” So to rectify Hot Rod’s absence I made a companion piece! This allowed me the real estate to feature a large amount of Sharkticons without shrinking Hot Rod of sticking him behind Kup. You can see the two side-by-side a little further down. Here’s a little look at the process of coloring. 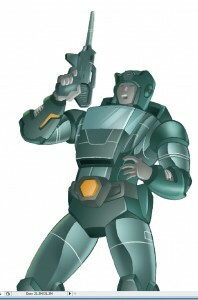 This is Kup’s colors minus the ink work. Here’s the two prints side by side! Twice the Sharkticons!